Chausson turned here to one of the earliest and most important of all sources of mélodie texts, La comédie de la mort ( 1838) by Théophile Gautier (1811-1872), an important figure bridging the gap between the Romantics (such as Hugo) and the Parnassians (such as Leconte de Lisle). As an avid book-collector it is likely that the composer owned a copy of the sumptuous first edition the publication of which had inspired Berlioz to write his six Nuits d’été songs, and Gounod his first mélodie, Où voulez-vous aller? In Gautier’s collection, this poem follows Les colombes which was to be set so beautifully by Manuel de Falla. The poet’s title (in this first edition at least) is not Les papillons, but simply Pantoum (the Malay verse-form ‘Pantun’). This is not a Pantoum in the later sense that governs the form of the scherzo movement of Ravel’s Piano Trio; rather is it a 12-line form with an ABAB rhyming scheme where ‘the first couplet, the sampiran, tends to be highly charged and evocative, while the second couplet soars, sometimes obscurely, on the basis of the first.’ Here Gautier is the pupil of Victor Hugo who set the example for the form in Les Orientales, and the younger poet’s second couplet soars in the ‘bleu chemin’ exactly as required. The composer follows the poet’s skyward journey with music of the greatest delicacy. The extremely tricky piano writing, semiquavers alternating between the hands, is as light as butterflies’ wings—although with a single miscalculation of the wrist it is all too easy for the pianist to end up with embarrassingly entangled digits. The vocal line of this through-composed song is genuinely charming, with a dash of salon gush and nothing more than a hint of melancholy at the final cadence. The marking of Vif (Chausson often prefers the tempo markings of the clavecinistes to Italian terms) discourages introspection. The coquetry of the ritenuti at the end of the first and second strophes, the swooning cadence of the last verse and the pretty little envoi are all part of a salon formula that this composer did not deign to use very often. It is interesting to see that he could do so when he chose. 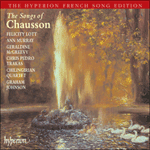 The whole thing is a brightly coloured and ethereal scherzo, and more original than Chausson realised. He could have explored this vein more in his songs without compromising his individuality. Prendre le bleu chemin de l’air? Ma bayadère aux yeux de jais. S’ils me voulaient prêter leurs ailes. Sans prendre un seul baiser aux roses. J’irais à vos lèvres mi-closes. Take to the azure path of the air? Do you know. O beauty of beauties. Were they to lend me their wings. Without kissing a single rose. I’d fly to your half-closed lips. Flower of my soul, and there would die.